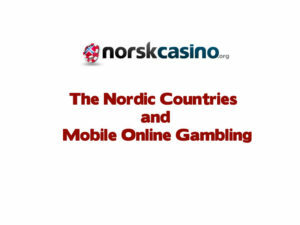 What is it about the Nordic countries that sees so many small businesses opening up based in Norway and Sweden and Finland in the mobile online gambling sector? The answer seems to lie in the regional legal and political situation rather than a predisposition for online gambling for those northern European countries that see a lot less light in the winter months. One such example is NorskCasino.org where you can play slots, or Spilleautomater as they are called in Norway and there you will gain a wide amount of choice in terms of trying and learning about games to play on a mobile website. The fact that so many companies like this exist in Norway and Nordic countries means that the business in itself has become a rather large specialist cottage industry in the region. With the demise of Nokia and so much tech talent being displaced as the company succumb to US and Korean competition over the last ten years, it may come as a welcome money earning stream for entrepreneurs and technology companies seeking to gain access to this large user base of potential online gamblers.